With all the problems of the world, it’s easy to become overwhelmed, or to feel as though the things we’re doing can’t possibly make a difference. Been there, done that. In fact, I still feel that way some days. Happily, today’s not one of ‘those days’ though. I really can’t believe how much warmer and more comfortable I feel using my ‘new’ fingerless gloves! The pictures I saw online of this project all showed them made using heavy knit sweaters, but I felt I wouldn’t be comfortable with all that bulk and I was right. The thinner knit is perfect for me. If you haven’t already tried this remedy I suggest you go to the back of your closet right now, find an old sweater you don’t wear anymore and cut the sleeves off, then cut a thumb-hole. You can sew it all up and make it nice and neat, or you can do like I did and just leave it as is and be warmer within 5 minutes. Whatever your choice, you won’t be disappointed in the comfort they offer, I promise you. Oh yeah, if you don’t cut too much sleeve off the sweater, you can turn that raw edge under and have yourself a vest or shell to wear under other things. It’s still hard for me to believe that something this small made such a difference in my comfort. Of course my cold hands aren’t part of the world’s problems, but the reality is that we are fast approaching a tipping point tin terms of climate disruption, food production, financial sequestering meltdown and Peak Oil. (Yes, I KNOW the stock market is breaking records and I personally couldn’t be happier about that, but knowing that what goes up must come down concerns me too.) So, cold hands aside, with problems this big, what can I do about them? Like the sparrow, one does what one can. Whether it’s growing a tomato in a pot, or participating in a rally against the proposed XL pipeline, we can all do something. What are you doing to help mitigate the coming changes in our world? What are you doing to make your life and that of your family and community more resilient and self-sufficient? Do you feel overwhelmed~ or empowered? Please share your thoughts in the comments section below. Tomorrow might be ‘one of those days’ for me and your comments might be exactly what I need to get through it. Spot checking at a local grocery store, a quart of Swanson’s vegetable broth costs $3.29. At that price, the 8 qts I made today then are worth $26.32 (plus tax!). And since I’ve started using Tattler Brand Reusable Canning Lids and Seals, I don’t have to pay for metal ones anymore either. All my canning jars were collected free over the years, and my canner is now 38 years old. My total cost: about 60 cents worth of carrots. The self-sufficiency and pride in producing something that tastes so good from food waste~ PRICELESS! So, what’s this got to do with Transitioning? Skills like growing food and preserving it for later use, being able to repair things rather than buying new ones, or repurposing something old into something new can help us cultivate an inner resistance and resilience that, regardless of where the stock market ticker stops at the end of the day, can help us feel in control of our lives, at a time when many of us are having a hard time with that. Even if Peak Oil was a myth, even if our futures turn out rosy, isn’t that a good feeling to have? According to Wikipedia, “In the South, Blackberry Winter is referred to as a period of cold weather as low as 20 °F in late spring when the blackberries are in bloom. 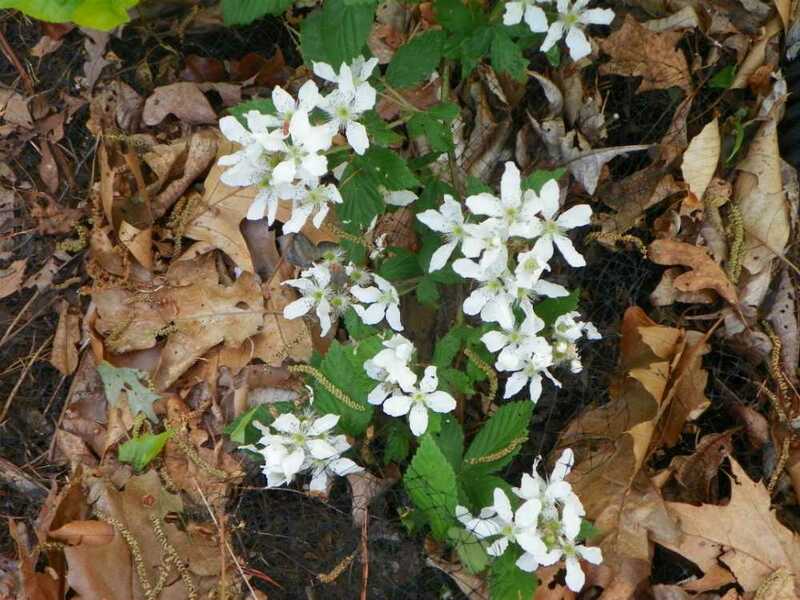 Prior to technological advances in meteorology, farmers would use such terms to know when to plant certain crops.” According to the wild blackberries that are blooming all around the edges of the woods that surround our cabin, and according to our outdoor thermostat, I’d say “we’re there”. Sometimes it amazes me how reliable some of the weather terms are in this part of the country! ‘Dogwood Winter’ is another uncannily accurate occurrence, as is “Full Moon, Frost Soon”. I love learning about our region’s sayings, folklore and wive’s tales (or, as a young friend of mine calls them “Wise tales” which is often closer to a truism than the standard ‘wive’s’ tales.) 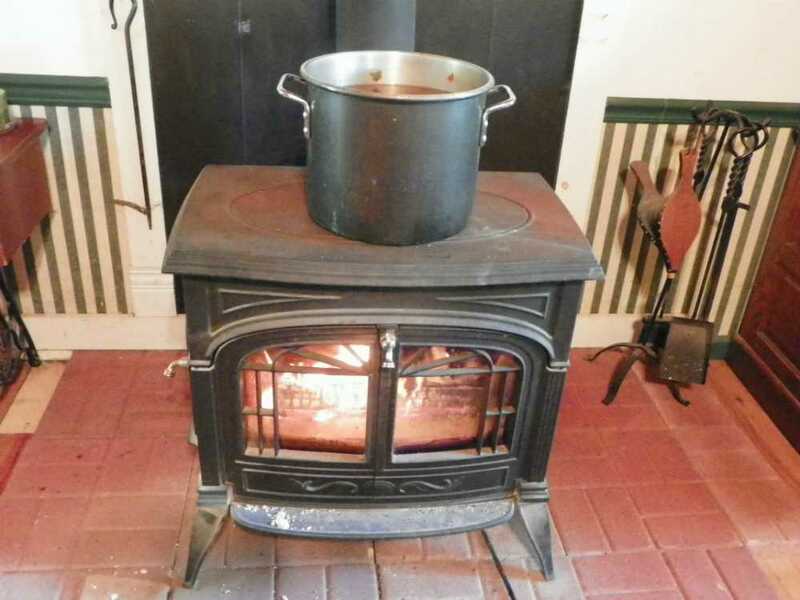 Regardless, it was cold enough to have a farewell fire in the wood stove today. Tomorrow I’ll apply a good coat of stove black to it and clean the glass window so it will be ready for fall’s first frost next October. I decided to take advantage of the unexpected free heat this morning and baked some foil-wrapped potatoes in the coals to go with our supper and simmered 2 gallons of homemade vegetable stock on top of it. 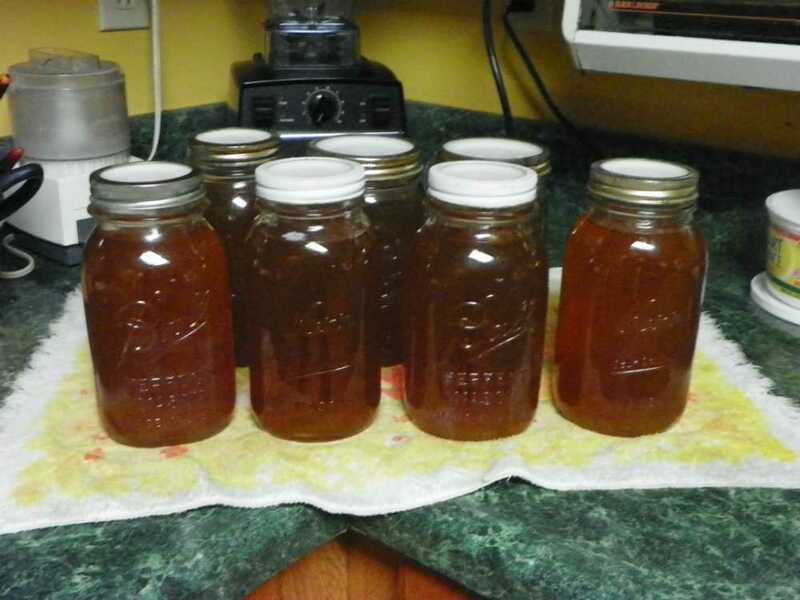 After the broth simmered for hours and hours, I strained and canned it, then fed the warm, soft veggies to the worms and the chickens. ‘The girls’ loved the special treat, and I loved not having any waste! This unexpected ‘winter’ day offered us plenty of bread labor, as well as personal time-Michael went to the library and the feed store, then made a crock pot of oatmeal and transplanted all the tomato seedlings to larger pots -freebies that a friend that is downsizing her garden gave to us. The tomatoes will go into the main garden around Mother’s Day. I did my canning, wrote some thank you letters and caught up on some other correspondence, mixed up a fresh batch of laundry detergent, and finished the book I’ve been enjoying: “See You In A Hundred Years”- the true story of a modern-day couple and their young son that decided to spend a year living as one would in 1900. The author writes for National Geographic’s “Adventure” magazine, and decided to have an adventure all his own to write about. And boy, did he! It’s in the library if you’re interested. I can honestly say today was busy, but precious. Hope you’re enjoying your Blackberry Winter too!